Is Nature completely left-handed? Does time-reversal symmetry breaking-- needed to create the excess of matter over antimatter we see-- still manifest itself now? With TRIUMF's neutral atom trap we can deduce the momentum of the neutrino produced in nuclear beta decay from the momenta of the other products, in particular that of the very low-energy final nucleus (with all angles collected in a uniform electric field). Then we can study the angular distribution of neutrinos with respect to those other products, testing the low-energy predictions of the Standard Model's electroweak interaction to see if there is room for other interactions. Spin-polarized observables in the beta decay of 37K can be a sensitive probe of new physics if measured precisely. The TRINAT facility coupled to the exotic beams produced by ISAC/TRIUMF is well-suited for such measurements. 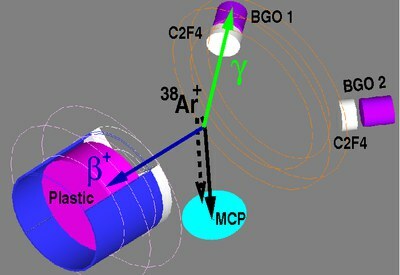 The short-lived atoms to be studied are first cooled and localized by the neutral atom trap, then highly polarized. Then both the recoil and emitted positron are cleanly detected. Measurement of the beta, neutrino, and nuclear recoil asymmetries with respect to the nuclear polarization to 0.1% accuracy will be complementary to other searches for new physics, like direct high-energy searches for new force-exchange bosons. 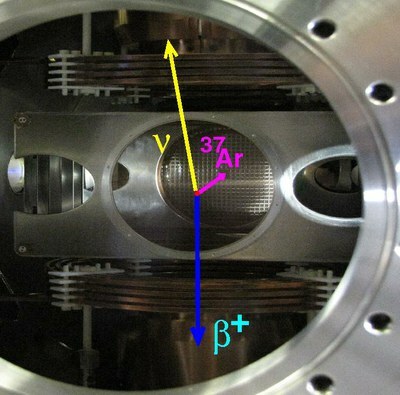 We've published the best asymmetry with best fractional accuracy in nuclei or the neutron: https://journals.aps.org/prl/abstract/10.1103/PhysRevLett.120.062502 https://arxiv.org/abs/1706.00414 in agreement with theory at 0.35% accuracy, which we interpret as a lack of evidence for wrong-helicity electron neutrinos or for interactions that couple to them. We are working to improve this measurement and extend the techniques to the neutrino and recoil asymmetries. We are also testing time-reversal symmetry in beta-neutrino-gamma coincidences, a challenging extra coincidence for us that needs some creativity. When parity violation was discovered in the late 1950's in beta and muon decay, people immediately proposed experiments testing time-reversal symmetry, hoping its violation might also be large.